I wrote a story for David Sedaris. David Sedaris is a pretty good writer of stories. If you haven't heard of him, he's sold a few books (9 books, >7 million copies), traveled a bit (lives in North Carolina, England and France and shops for culottes in Tokyo), shares his humorous tales with a few audiences (sold out houses), speaks regularly on a few radio stations (NPR and BBC ring a bell? ), and has been featured in a few local magazines (local if you live in Manhattan or, you know, the world). So David Sedaris does not need my story. But when I had the chance to meet him in person a few weeks ago, I had one ready for him, just in case. Because he collects stories like some people collect, I don't know, whatever collector type people collect. And I like to be prepared. Now, meeting David Sedaris isn't that unusual. He is a gracious author who loves to interact with his fans and autographs books before and after his concerts. He takes time to compose and often draw very personal (and sometimes hilariously obscene) autographs in the books people bring for him to sign. He enjoys talking to his fans. He remembers really detailed things about people because, as he told me, "That's my job." But my meeting him was a bit more personal. 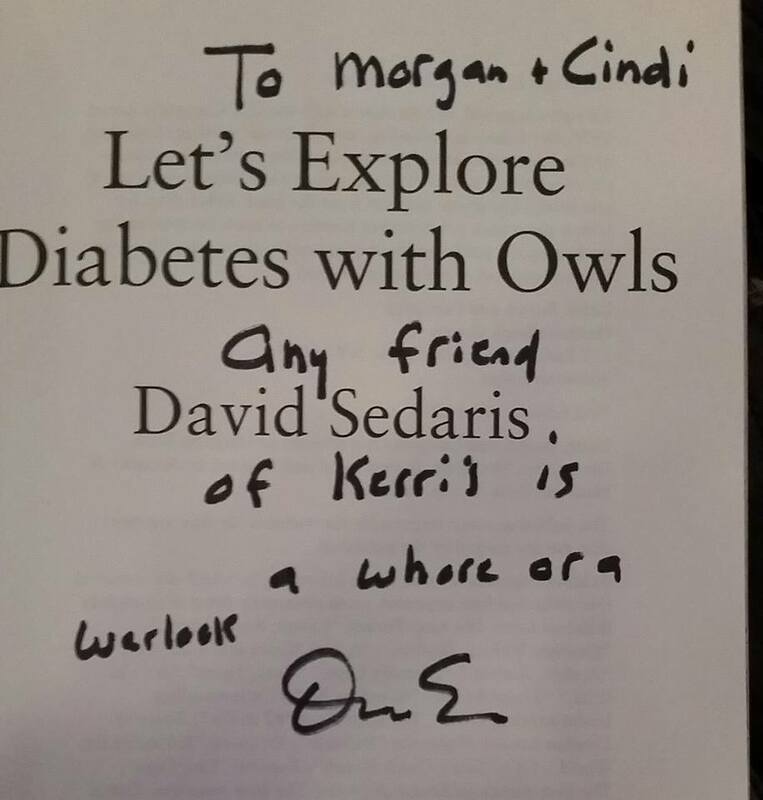 Because as luck would have it, Mr. Sedaris and I have a mutual friend. Our mutual friend is a most remarkable woman but someone you've never heard of and probably haven't met. If you have met her, it is unlikely that you've had a conversation with her because that's not how she rolls. She's a lovely person, and you would be lucky if she felt comfortable enough to talk to you, but usually she just wouldn't. Unless you're unusual. Both of us have a fear of meeting new people. Both of us have a thing we repeat every time we have to meet someone new: "Please let them be weird as me. Please let them be weird as me." Which is how she and David Sedaris became friends. Weird x 2. 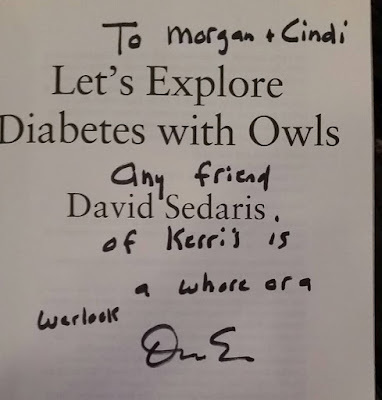 And that's how I got a more personal and private opportunity to interact with Mr. Sedaris. And why I was all ready with a funny story in case I had a chance to share. Because he is a collector of funny stories. And I didn't want to be the friend-of-a-friend who bombed on the meet-and-greet. But as it turned out, I didn't get a chance to tell him my story. I guess I could have imposed on him and made him listen to my story about Emerald Isle as I related how I knew his family vacationed there and acted like a regular star-struck stalker. But I didn't want to be a fame whore. I also had the dignity of my friendship to maintain. And I'm sure he gets enough stalkers. But it's still a funny - and true - story. So before I forget it, here goes. Mr. Sedaris (and my lovely rare friend KG), this is for you. Years ago I worked in arts management and decided to attend Duke University's graduate program in Nonprofit Management. Now, Duke University is in North Carolina. I am in South Carolina. Fortunately for me, since it was a certificate and not a degree, Duke offered the classes in week-long intensive sessions at artsy places like Wildacres Retreat. Unfortunately for me, they were intensive group sessions requiring a lot of team work and sharing and talking to new people and relating on a deeper level than I felt comfortable. We can't have everything, can we? The last session that I needed to finish my certificate was held at Trinity Center on Emerald Isle in North Carolina. This is a beautiful area by the sea, very rustic and simple with cabins and chapels and lots of areas for roaming. One afternoon, after a particularly grueling group-work session, the instructors decided to give us a break. I couldn't get out of there fast enough. I really wanted to go hide in my room and recharge my batteries from all the talking and interacting and being personable that I had been forced to participate in. But I had a roommate and said roommate decided to stay in our room and read, so that eliminated my peaceful alone time. Most of my colleagues had struck out over the sand dunes to relax on the beach. My complexion and the beach don't get along very well, and the idea of spending my break with more people chaffed me. I grabbed the blanket off my bed, took off across the road towards the beach, but detoured just before the sand dunes to a lovely green patch of grass with a bit of shade. The perfect refuge. I arranged my blanket just so on the lovely green grass. I took out my notebook so I could pretend to be taking notes and jotting down deep thoughts. Then I put on my darkest sunglasses so I could take a secret nap instead. Just as I was getting settled in my little patch of heaven, I caught a horrible sight in my peripheral vision. A person. Walking straight in my direction. Maybe he's heading towards the beach and is just lost, I thought. Maybe I am being paranoid, I mused. Maybe if I just ignore him he'll disappear, I hoped. But no. He walked towards me with intent, his bouncy gait and toothy smile irritating me with every step that brought him closer. "Hey! how ya doing?" he asked. I propped up on my elbow. I kept my glasses on so we couldn't make eye contact and I smiled - just enough of a smile to be sort of friendly, but not so much of a smile that he might feel invited into a conversation. "Hey, pretty good, thanks," I replied. We chatted, made the dreaded small talk, discussed the coursework and the people in our groups. He continued. "That was a pretty productive session we had before break. What did you think of it?" "I think you should leave me alone." That's what I thought. What I said was, "Yeah, it was really intensive." Then I saw my out. "Actually" - I tapped my notebook - "it was so intensive, I wanted to make some notes about it before I forgot, you know, kind of get away from the fray and have some quiet time to think about everything we discussed..." Dot. Dot. Dot. This was total BS. I didn't want to think any more. I wasn't intellectual. I was exhausted and I wanted to take a nap on my blanket on the grass like a toddler. I smiled a dismissive smile. He smiled sincerely in return. "Of course! I totally understand," he replied, his hand in the air. "I'll leave you to it, but I thought I should probably come over and let you know that you might not want to put your blanket here." I looked around me. The camp ground was across the two-lane highway from me. I was well off the road, near the dunes that stood between me and the beach. It was pretty and shady and green. I tried to imagine what might be wrong. "I'm sorry - is this not part of the property?" I asked, not wanting to do anything that would get me in trouble but reluctant to get off my claimed turf. He shook his head. "Oh, no, it's part of the property. I mean, if you want to stay there it's perfectly fine." I relaxed, glad I wasn't going to have to fight him, hoping now he would go away. "It's just...." he continued, "the reason the grass is so green there is that you're lying on top of the septic field for the camp ground. Enjoy your break, see you this afternoon!" He gave me a friendly nod and headed back across the road. All I wanted to do was get away from people and their crap, and my perfect chosen spot was literally a field of human feces. Later that day I was able to work this into an object lesson with my group. I hesitated to share it, thinking I would seem like an idiot, but it was funny. Somehow learning to laugh at my own arrogance and bad decision, and letting other people laugh at it too, made me feel...included. The week ended much better than it started. As I've aged, I've learned to choose an imperfect situation over one that is suspiciously fertile every single time. Because it's probably funnier. And less likely to be full of crap.